On Sunday evening July 20, 2014, Harav Avrohom Chaim Halberstam, shlita, invited the community to attend a seuda and siyum commemorating the 33rd Yarhtzeit of his father, Harav Zvi Hirsch Halberstam zt”l of Los Angeles. It was the early 1950’s and the Los Angeles community was growing, changing and expanding into other parts of the city. It was at this time in 1952 that Harav Zvi Halberstam zt”l came to the West Coast. Settling in Los Angeles, Harav Halberstam opened a shul and named it after the “Atzei Chaim,” HaRav Chaim Tzvi Teitelbaum zt”l, Sigheter Rebbe, (1880-1926). Rav Zvi Halberstam was a descendant of the Divrei Chaim of Sanz (1793–1876) and was a nephew of the late Sanz-Klausenburger Rebbe, Harav Yehuda Yekutiel Halberstam zt”l (1905 – 1994) . His Rebbetzin, Rebbetzin Brocha Halberstam shtichye, is the daughter of Harav Chaim Yitzchok Isaac Halberstam ztl, Slutfener Ruv, and a granddaughter of the Atzei Chaim of Sighet. She is also a niece of the late “Divrei Yoel, ” Rav Yoel Teitelbaum zt”l of Satmar (1887 – 1979) and the “Beirach Moshe” Harav Moshe Teitelbaum zt”l of Satmar. Rav Zvi Halberstam ztl was very close to these uncles and through their guidance and urging moved to the West Coast to establish Congregation Atzei Chaim of Los Angeles. The shul became the center of Chassidus and yiddishkeit for many years. The Hachnosas Orchim and chesed of the Halberstams was renowned throughout the world. Many travelers and Rabbonim relied on their open home. Harav Zvi Hirsch Halberstam was one of the pioneer Rabbonim who transplanted European yiddishkeit to the West Coast and was also one of the founders of the local yeshivas and the Bais Yaakov of Los Angeles. 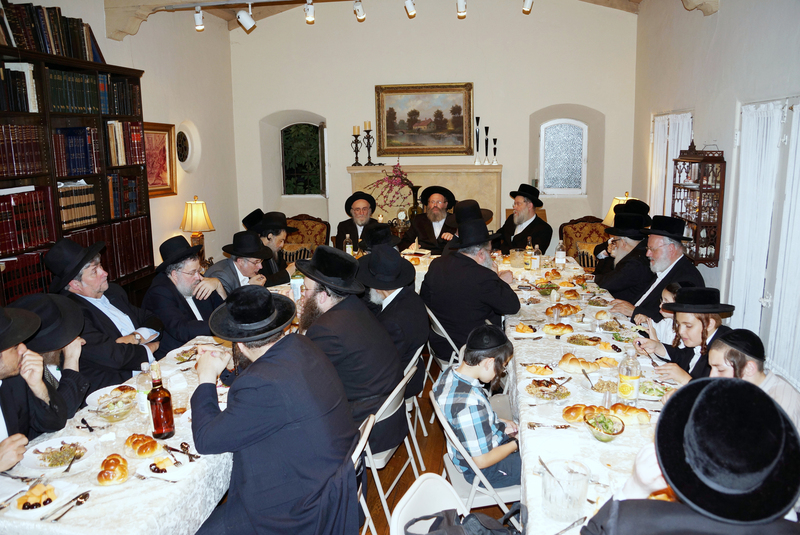 The yahrtzeit seuda and siyum was attended by many local Rabbonim and Baalei Batim of Los Angeles. His son and host of the seuda, Harav Avrohom Chaim Halberstam and his son-in-law Rav Avrohom Friedman of Brooklyn, New York addressed the attendees with divrei Torah and spoke of the many accomplishments of Harav Zvi Halberstam zt”l. The olam also heard from Harav Avrohom Horowitz who related fascinating stories of Harav Zvi Hirsch Halberstam zt”l.